Here's the next phase of the Back to Basics series from Ron and Myself. 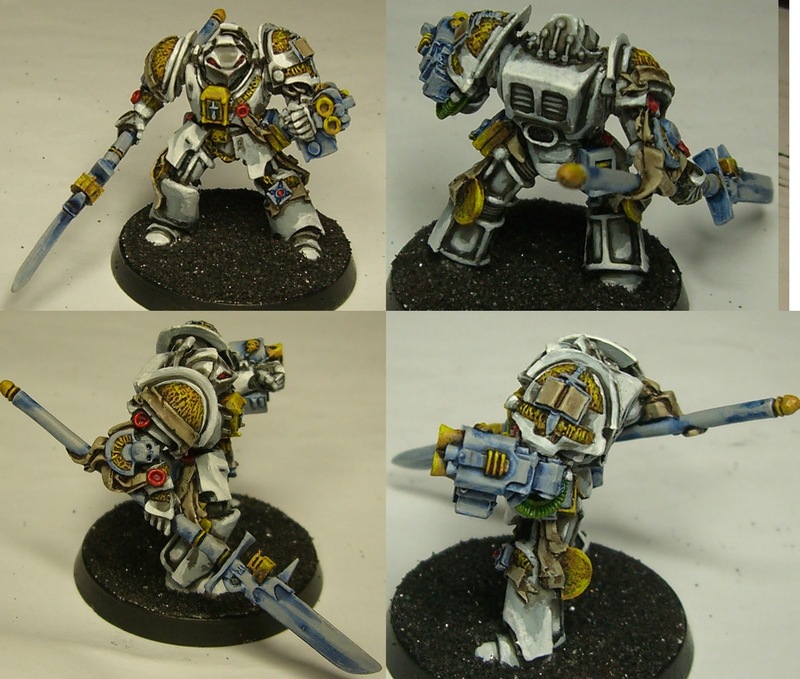 Take a look at Ron's excellent Terminator that he's painted up for this week's Back to Basics. We've both added a few semi-fancy but still pretty simple techniques this week - Ron's done some creative basing and nice freehand work on his model. 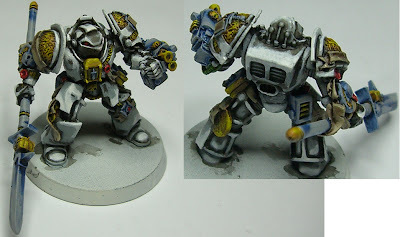 In the previous two articles, I talked about the differences between using white or black primer. Now we're going to look at various styles of miniatures. This way, between Ron and I, you'll see multiple methods of painting similar models. Keep in mind, the purpose of this series isn't to paint incredible models, it's to help people paint table top quality figures - all the steps you'll see here will be easy to follow, obvious and slightly exaggerated. I decided to paint things in a slightly different order this week. Part by part, rather than layer by layer. You'll see things are still relatively straight forward, though I've mixed things up slightly by adding a small dry-brushing step. In the following gold steps, I use a technique called "dry brushing." I'm not going to go into a ton of detail on the "how" but stick around because in a day or two, you'll get a full article dedicated to it. Essentially, you want to use an old brush, wipe as much paint off it until you'd almost think there's none left, then you rapidly flick your brush over the area to be painted to slowly add a highlight. Once you learn the right amount of paint to remove from your brush, this technique can be a great way to add easy highlights to any project. 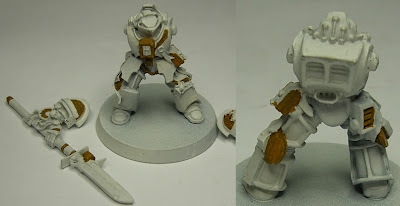 I've started with the golden parts of the knight's armour. To do so, I've based these areas with Snakebite Leather. Next, I follow with a wash of Devlan Mud to add some shadow. I'll get back to it later, but I also wash books, banners, tags, etc. First off, the reason I've used dry-brushing here is that it easily highlights all sorts of raised areas and runes that would be very difficult to paint individually. Second, lookit how messy it is. Because of all the flicking of paint, dry brushing usually gets all over the place. For this reason, it's best to dry-brush before painting the areas around. As a final step to the gold, I've used some P3 Cygnus Yellow to dry-brush highlight the edges of all the golden areas. I've used P3 because their paint tends to cover darker colours well. The next section I've painted is the bulk of his armour. Here, I've started with a light Fortress Grey. As I mentioned above, by dry-brushing first, I get the chance to cover up all the areas where I colour outside of the lines. Badab Black is what I follow up with. In the following steps I go really light. If I painted him again, I might try a darker grey. In this tutorial, I'm avoiding mixing paints. In previous tutorials I used painting lines on edges to perform highlighting. In this tutorial I go bolder, using large area highlights. In some areas, I nearly paint the whole thing. Here I've used Astronomicon Grey. Take notice though, that I'm not blending. All I'm doing is choosing colours/shades that are close(ish) together and painting large areas. As a final step to his armour, I use Skull White. In some areas, I've line highlighted, but mostly still used area highlighting. Again, no blending. You can distinctly see where one colour/shade ends and another begins. For someone who wants to get a little fancy, you can blend the transitions with less paint or thinning the paint with water. In the later photos, you can see how this contrast makes the entire model much more bold. 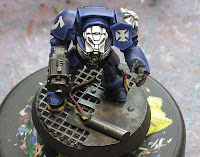 ...which I follow up with Asurmen Blue to add a different metallic look. 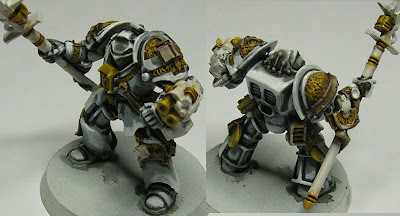 Fortress Grey is used to add a final highlight on the knight's metallic areas. After the Devlan Mud on white primer in an earlier step gave the books and such a little shadow, I round that our using Kommando Khaki to edge highlight. Just to do a little final cleanup, his eyes and seals are treated to a dark Red Gore and highlighted with P3 Khador Red. (again, because P3 stands out over dark coloured layers. Then, the tube behind his left arm is painted Camo Green and washed with Thraka Green. And here we are! Another table-top quality miniature completed. So this week we've looked at a few new techniques. Dry-brushing is the more complicated, (though not hard to learn and super helpful) but a larger article will follow in a few days. Then, instead of line highlights, I paint larger areas. Up close, the obvious transitions can sometimes be a little ugly, but from further away this actually creates nice strong contrasts which help the model stand out on the battlefield. A little washing and dry-brushing does go a long way and these are two things I highly recommend that everyone learns. I love the look of this model- especially the head. Is it older? Thanks for showcasing the drybrushing and wide area highlights. These are techniques I use a lot and like the way they look. Yes, it's messy up close, but on the table it looks awesome. 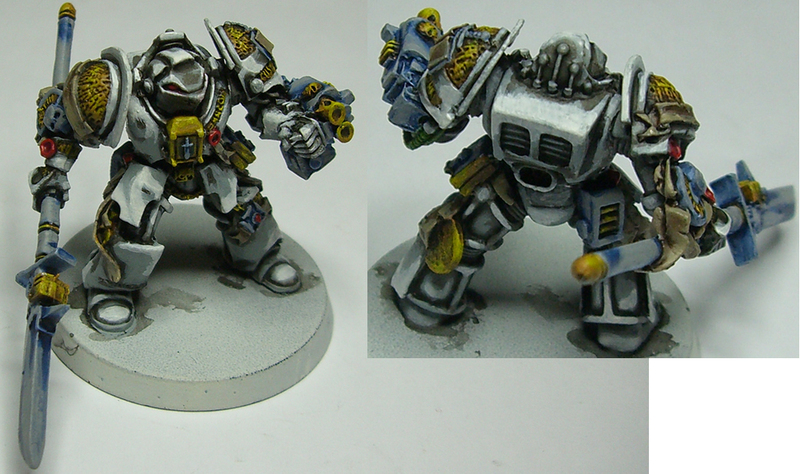 Also liked the small amounts of blue on the metal areas- nice color theory there. Very nice Dave, I forgot you were doing a GKT this week. @Loq: I'm not sure what era it is... I have all these minis I've picked up used / bundled over many years, which is great when I just want to grab some to do a tutorial or give to friends when they want to try out various things. @Ron: Thanks, and I'm looking forward to seeing your version in the metallic tutorial. Nicely done tutorial. It's like NMM for beginners, which I've yet to see. The nice part is you can start with something like this and as you get better with technique just start introducing some blending. It's much easier going that route than trying to start off as a master NMM painter. Yep. Too many tutorials don't take newer artists into account and it can be very tricky to follow them if you don't know easier steps. Not only that, but it becomes disheartening to someone who follows all the steps and theirs looks nothing like what they were trying to create.